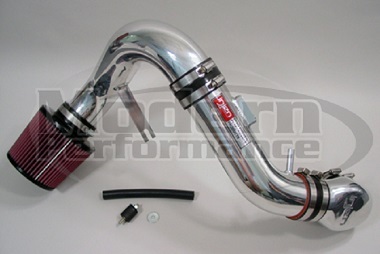 Injen has released their famous SP version cold air intake for the 05+ Cobalt 2.2L motor. This intake features 3 inch tubing that's mandrel bent for nice smooth bends, and a high flow washable/reusable air filter. This intake is also unique because it can be converted from a cold air intake to a short ram so that you can change the design based on seasons, or your preference. Want the most power possible during summer? Make it a cold air intake. Don't want the filter getting wet from snow and ice in winter? Convert it into a short ram! This intake has been dyno tested and proven to make an additional 7 hp at the wheels, and 6 lbs of torque. That's a difference you can feel, and that's horsepower that will help improve your Cobalt 2.2's gas mileage as well! Piping convertible from short ram to cold air. Available in polished and black.